One of the advantages of being a student is the holidays – four weeks off Monday college days. However, the downside is that there are essays to write (and just two weeks off from the church bit of training), which amongst all the excitement of Christmas, is rather arduous. My cunning plan for having a productive Christmas was that I was going to be spending the festive period at a theological college. Sometimes, just sometimes, the fact that my parents live at a college comes in handy – at Christmas when the massive college fridges are very useful; last year when we needed all their urns during the water shortage; and, when I need books for an essay. I didn’t need to go outside to get there and could wear my slippers. The library was empty – and likely to stay that way – meaning I could listen to music (and, inevitably, sing along). From my table I had a view, and not just any view – one of vegetation. In London I’m lucky if I get a Victorian lamp-post. The aforementioned vegetation was mostly my parents’ garden, which meant that for part of an afternoon I had a great view of my Dad trying to re-build his arch which the wind seemed determined to decimate. From my seat, I could also see the window of my parents’ dining room. This meant that I could stay studying until the light came on in that room, at which point I knew it was time to offer assistance. My study breaks included home-cooked meals which I didn’t have to pay for. You don’t get that at the BL. Amazed would be something of an under-statement. I choked on my cup of tea in astonishment. Now, Mock Of The Week is on BBC2 now. Unless you’re in Northern Ireland, where it’s on later due to the ferry bringing the VHS being late. Secretly, I’m rather looking forward to the Royal Wedding. Secretly, I’ve rather enjoyed watching a variety of spurious Royal Wedding documentaries. Secretly, I’d rather like a commemorative biscuit tin. My parents are die-hard anti-monarchists (difficult to use ‘republican’ as where they live it means something rather different) and brought us up with their belief that our royalty were a rather unnecessary historical throwback. [In fact, my Dad even claims that should he ever be offered an Honour he’ll refuse. I somewhat suspect that my Mum will try and dissuade him from this, just so she can have a hat wearing opportunity.] We read the Independent for a while partly owing to its pledge not to feature royals on its front page. But secretly, while growing up, I was fascinated by them. Maybe it was owing my historical bent; it could have been the fact that I shared the monarch’s name; perhaps it was because Wills was just one school year below me; perhaps it’s because my formative years – the late 80s and early 90s – were dominated by royal scandal, culminating in the death of Diana the week I got my GCSE results. Actually, there is one reason alone that set me upon this trajectory: my birth date. July 29th 1981 is a historic date that’s been much mentioned in recent months – the day Lady Diana Spencer wed Prince Charles in St Paul’s Cathedral while the world watched. My parents didn’t – not simply because they had no TV in Tonga, where they were living at the time and would have been disinclined to watch it anyway – but because my mother was giving birth to me. Legend has it that she got a little irked when medical people kept sloping off to listen to the ceremony on the radio. I should clarify that my date of birth is actually the 30th, thanks to the time difference, but I entered the world just as the reception was kicking off and as a result certain relatives were convinced that I shared my birthday with a terribly auspicious event, meaning that on our return to England I was blessed with much royal memorabilia – including stamps, and a mug that I later auctioned on eBay. Somehow Ladybird books on the two great royal weddings of the 1980s ended up on our bookshelves and I read them with quiet fascination, absorbed by the dresses, traditions and ceremony of it. For years this interest has lain dormant. I didn’t join in with the speculation of which university Wills might attend, nor did I include possibilities on my UCAS form in the hope I might one day become a princess. I paid scant attention to Prince Charles’ second marriage and uttered a groan when the royal engagement was announced fearing months and months of pointless regal drivel being the focus of the news – fears that have certainly been realised. My resentment was muffled somewhat by the extra public holiday, but I later resented the pressure this put on certain work deadlines. I also still deeply object to the media’s blanket coverage of the event, to the detriment of world events like Alabama’s tornadoes and the situation in Syria; not to mention the side-lining of coverage of next week’s electoral reform referendum. Effectively guilt-tripped into it then. And now I’m rather excited. Baking has been done – my job tonight/first thing tomorrow is to make tons of sandwiches and then hopefully travel on the Jubilee line unscathed by enthusiastic wedding watchers to the comparative safety of Marylebone. London looks rather fabulous, or rather central London does. 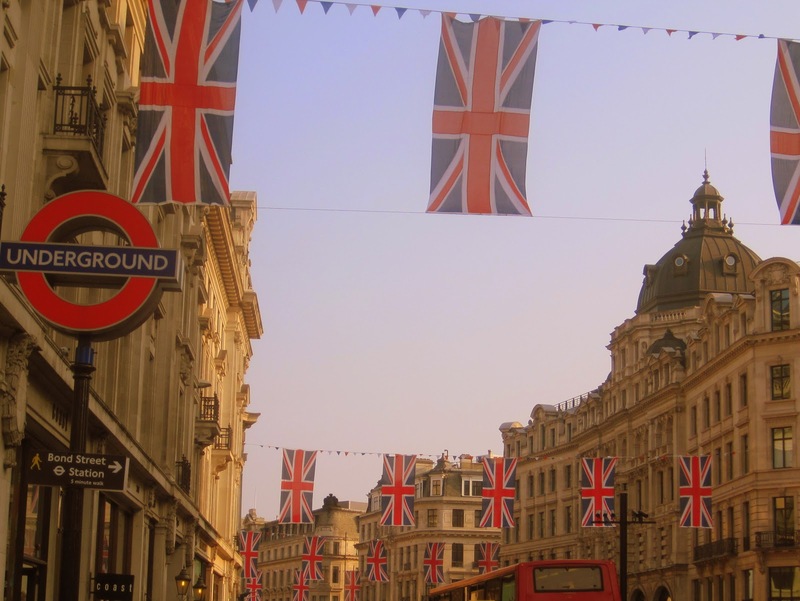 Regent’s Street’s patriotic flags are distinctly more tasteful than Bermondsey’s plastic (with the happy couple superimposed) version. Tomorrow I will attend my first ever street party; I will watch the wedding on a big screen at church; and next week – providing they’re reduced – I will acquire a commemorative biscuit tin. Mum and Dad, I’m so terribly, terribly sorry.